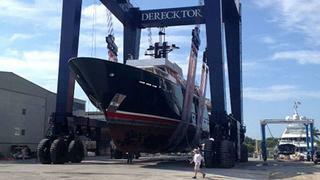 Derecktor Florida's refit of Feadship's classic 46m The Highlander, which started her refit this summer, is proceeding on time and on budget, and is scheduled for launch in late November. The hull extension is completed and is now in the hands of the painters. Refurbishment of the engine room, including the addition of Quantum zero-speed stabilizers, is proceeding well and systems are starting to come on-line. Other projects include a completely new air-conditioning plant and updates to all the hotel systems. This iconic vessel, designed by the famous Jon Bannenberg and delivered by De Vries Scheepsbouw in 1986, was built for the equally iconic Malcolm Forbes of Forbes magazine. Meanwhile, the 43.2m Troy-built explorer yacht The Big Blue departed on 12 September for sea trials after 15 months at the yard. Work involved overhauling various systems aboard, a complete interior refit with changes to the layout and the addition a heli-deck, requiring major structural changes.